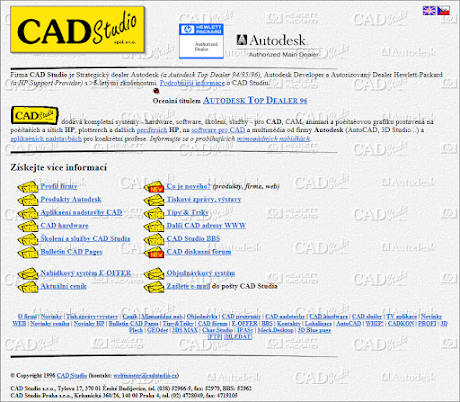 We celebrated 20 years of the web site CADstudio.cz. This address is active since the year 1996, since the very beginning of the Internet in the Czech Republic. By that time, the mostly used (and practically the only) web browser was Netscape, and vistors with a purely textual web browser were not an exception. Google existed only in the heads of Mr. Page and Brin and the internet world was sparsely populated just with web sites of universities and big companies like HP and Microsoft. In the whole world, there were only 250.000 registered domains (and only 23.000 one year earlier) - today, there are more than 1.1 billions of them. The most popular sections of the original CADstudio.cz web site with about 15 pages total (today it has about 3000 pages) were already then the section "Tips and Tricks" and the section "BBS", which continued the original service "CAD Studio BBS" operated on the FIDOnet network using modem-connected computers - you were able to "dial" it on a specific phone number through a modem in your computer. Who remembers these old pre-internet days. And these pages with CAD tips, utilities and disussions were extended 4 years later to today's web portal CADforum.cz, currently with over 750.000 registered users worldwide. The graphic style of the web site corresponded to then current belief of an attractive web site design. Please note that a typical visitor accessed the web through a modem with a "lightning" speed of 9.600 bits/sec.